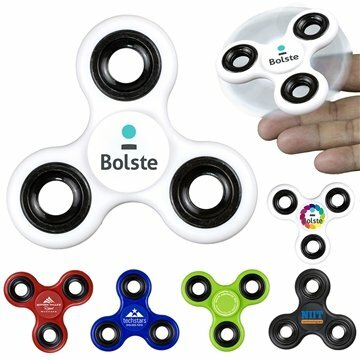 This fun and therapeutic stress reliever will keep your brand at the center of attention for hours on end. The LogoGyro﻿ is made of strong ABS plastic with solid metal booster inserts and steel ball bearings. Spin it between your thumb and middle finger, balance it on any finger or spin it while it lays flat on your desk. WARNING: Choking hazard for small children. The cost was really reasonable Excellent Quality... Great for decorations and very durable. Graphics were excellent. Happy using the product. this is one of my all time favorite promotional items. They looked very expensive, yet cost me very little! Love the imprinted logo Nothing liked least.